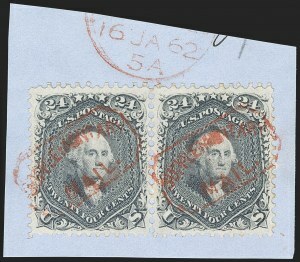 Category — 1861-66 Issue Stamps, cont. 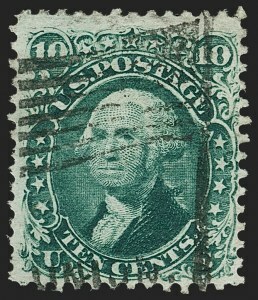 FINE APPEARANCE AND VERY RARE. 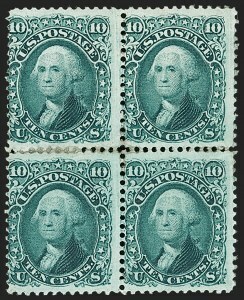 ONLY TWO PAIRS AND THIS SINGLE OF THE 1861 10-CENT GREEN IMPERFORATE HORIZONTALLY ARE KNOWN. A PHENOMENAL RARITY. FINE. 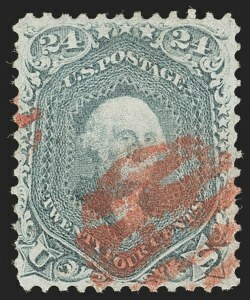 A SCARCE SOUND ORIGINAL-GUM BLOCK OF FOUR OF THE 12-CENT 1861 ISSUE. 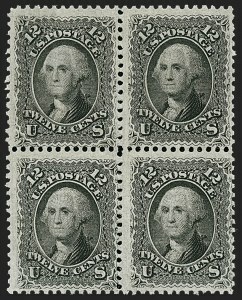 Sound blocks with original gum have always been scarce, but the harvesting of centered singles has left very few blocks intact -- the largest recorded unused multiple is a block of six. Most remaining blocks are off center or have faults. FINE-VERY FINE APPEARANCE. 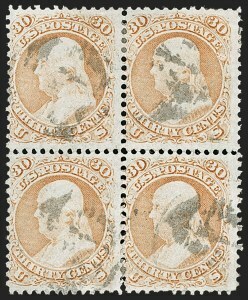 AN EXTREMELY RARE ORIGINAL-GUM BLOCK OF FOUR OF THE 24-CENT 1861 ISSUE IN THE BROWN LILAC SHADE. PERHAPS THREE OR FOUR EXIST. 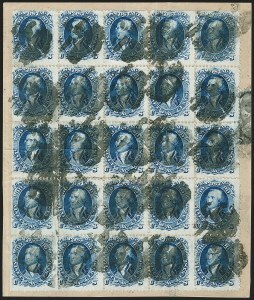 We would have lost a bet if asked about the rarity of unused blocks of Scott 70 or 70a before trying to answer the question of how many exist. 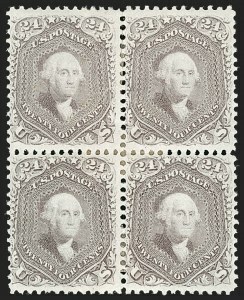 The collections that are famous for blocks -- Caspary, Lilly, Ishikawa and Klein -- did not have any Red Lilac or Brown Lilac unused blocks. Only one other is contained in Power Search. EXTREMELY FINE. 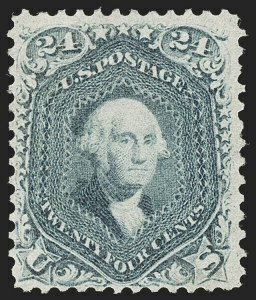 A GORGEOUS PAIR OF THE 1861 24-CENT STEEL BLUE TIED ON A PIECE BY THE SUPPLEMENTARY MAIL CANCEL. TRULY PHENOMENAL IN EVERY RESPECT. 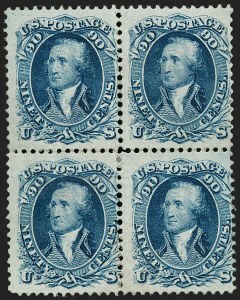 We are surprised this pair has remained intact, as the 24c Steel Blue shade is difficult to find with such choice centering. VERY FINE APPEARANCE. 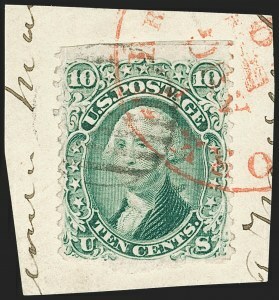 A SCARCE UNUSED EXAMPLE OF THE 24-CENT 1861 ISSUE IN THE VIOLET SHADE ON THIN PAPER, SCOTT 70c. VERY FINE. 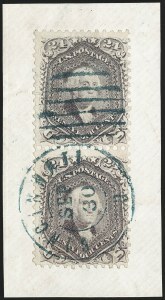 AN ATTRACTIVE PAIR OF THE 1862 24-CENT VIOLET ON THIN PAPER. 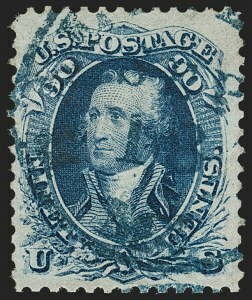 FINE APPEARING ORIGINAL-GUM BLOCK OF FOUR OF THE 30-CENT 1861 ISSUE. 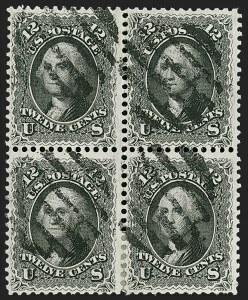 A BLOCK OF FOUR IS THE LARGEST RECORDED UNUSED MULTIPLE. 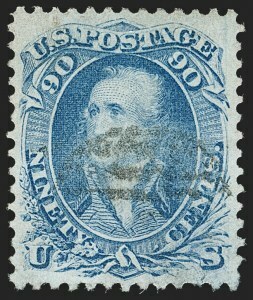 As this block demonstrates, the 30c 1861 plate left very little space between the stamp subjects. 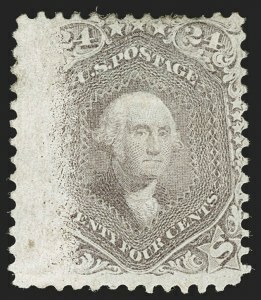 Consequently, perforations usually cut into part of the design. 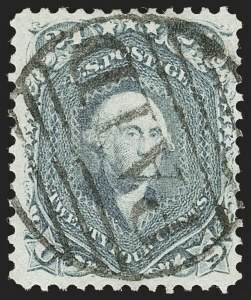 This fact is acknowledged in both the Scott Catalogue and Stamp Market Quarterly, and the 30c 1861-68 Issue is one of the few for which centering standards are adjusted accordingly. 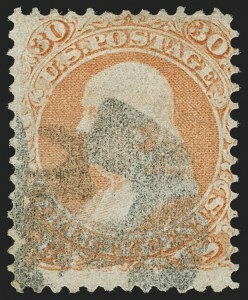 Virtually every well-centered original-gum block of the 30c 1861 has been broken into singles. FINE APPEARANCE. 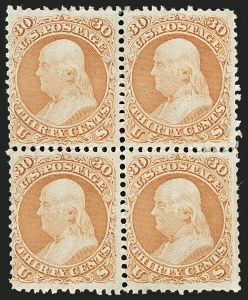 A RARE ORIGINAL-GUM BLOCK OF FOUR OF THE 90-CENT 1861 ISSUE. FINE APPEARANCE. 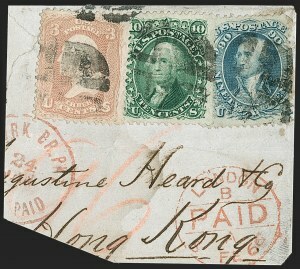 THIS IS THE LARGEST RECORDED MULTIPLE OF THE 90-CENT 1861 ISSUE. A WONDERFUL EXHIBITION ITEM. 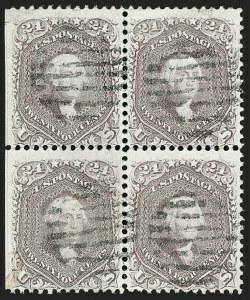 The largest recorded unused multiple is a block of eight. 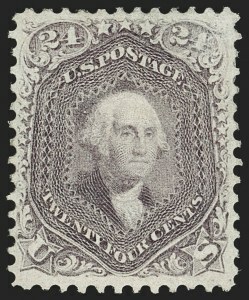 This block of 25 represents $22.50 in postage, which is the equivalent of $626 in today's dollars. 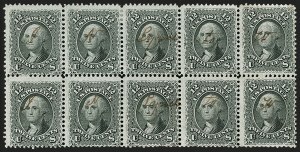 A block of 20 is also known with similar centering on a similar piece, with different cancels (see our 1986 Rarities sale).